The Pilatus PC-24 made its first landing on an unpaved runway as the jet is currently undergoing a program of post-certification tests with special emphasis on unpaved runway operations. Pilatus plans on obtaining “Rough Field” certification in the fourth quarter of 2018. 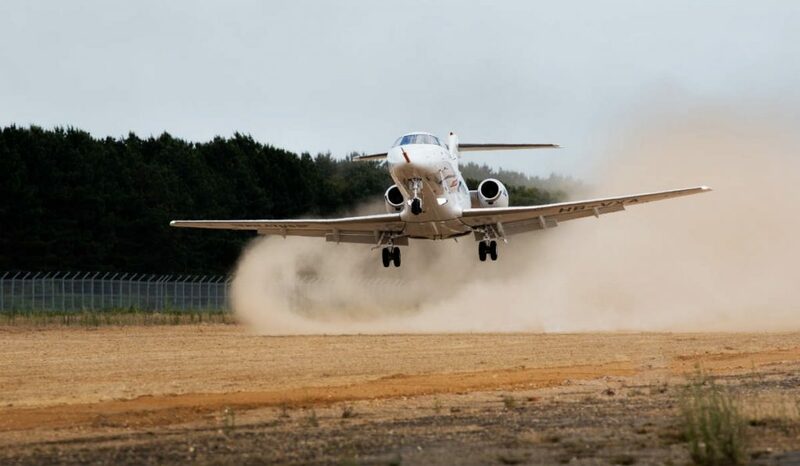 Pilatus spent two weeks at the Woodbridge Airfield locate north east of London, testing the PC-24’s landing and take-off capabilities on the airfield’s unpaved runway. The company explains, from the outset, the PC-24 was designed for short unpaved runways to open up a large degree of flexibility and new opportunities. The PC-24 provides access to almost twice as many airports worldwide, explains Pilatus, compared to other jets currently available on the market. Pilatus obtained basic certification for the PC-24 on 7 December 2017. Since that date, five aircraft have been delivered to customers in Europe and the United States. A total of 23 PC-24s are scheduled for delivery in 2018. The Royal Flying Doctor Service of Australia (RFDS) will use the PC-24 for medevac missions in Australia from 2019, which will naturally involve landing on and taking off from short unpaved runways. The PC-24 order book is closed for the time being. Pilatus plans to accept new orders in 2019.